Emperor Palpatine has built a small army of loyal servants, including Darth Vader, his powerful enforcer and most trusted servant, and the Force-wielding Shadow Guards who carry pikes with lightsaber-like blades. 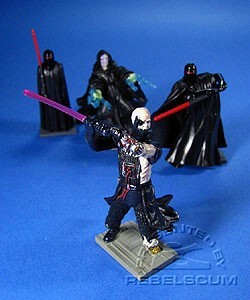 These dark guardians must prove their loyalty and combat skills when they face as assault from the Rebel Alliance, leaving Vader badly damaged. Also included in this set is 1 of 4 randomly-inserted exclusive cheat codes for the upcoming Star Wars; The Force Unleashed video game.